home / Multimedia / The Holy Land in news / Books, Bridges of Peace: cataloguing of 17th century collection .. The cataloguing of the 17th century books preserved at the General Library of the Custody of the Holy Land has recently been completed. This represents a further step in the knowledge and enhancement of the library heritage of the Franciscans of the Holy Land. The project “Books, Bridges of Peace”, sponsored by CRELEB – the European Research Center on Books Publishing and Libraries of the Catholic University of the Sacred Heart in Milan – with the support of Association pro Terra Sancta, continues with passion and enthusiasm. The collection consists of approximately 2,000 books whose descriptions, produced according to high scientific standards, are now fully available online in the catalogue of the General Library of the Custody of the Holy Land. The collection is indeed an extremely rich one and of notable interest. 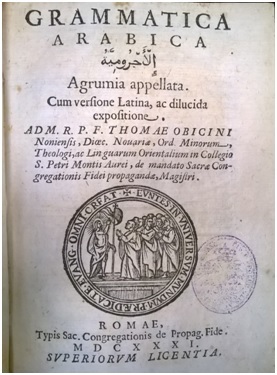 Alongside the large volumes with the works of the Church Fathers, the principal theological and moral treatises of the period, and the large presence of hagiographic literature can be found a series of works aimed at the Middle Eastern world: liturgical texts in Arabic and Latin (and also a polyglot Bible in nine languages! ), but not only this. There is also an extensive presence of dictionaries, grammar books and bibliographies dedicated to Semitic languages and cultures. 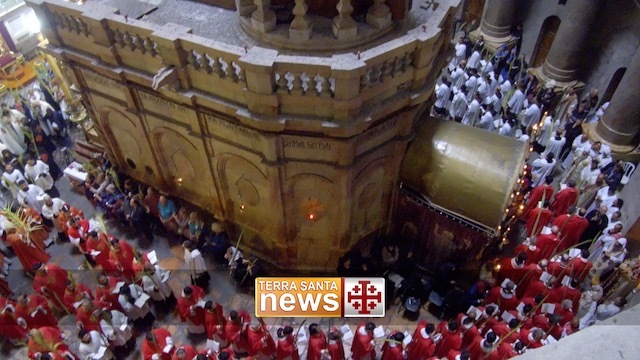 An extraordinary heritage that bears witness to the desire of the Franciscan friars to know and understand the culture of the many different identities of the Holy Land and, in general, of the Middle East. A longing still alive today in many people, and not only the friars, who will now have the possibility, through studying this rich collection, to deepen the story of this dialogue and to embark on yet another. The project Books, Bridges of Peace thus continues its mission: the enhancement of the Franciscan library collections and the building of spaces for dialogue among peoples of different cultures and religions, seeking to put in practice the words of the Custos of the Holy Land, Father Francesco Patton: “Everything that disseminates and promotes culture helps to foster peace, to build peace”. Numerous other projects are in the planning stage: from the cataloguing and enhancement of the precious Latin manuscripts to the important section on the history and activities of the Custody of the Holy Land over the centuries. And also exhibitions, both virtual and real, notably that of some of of the Franciscans’ incunabula, which will also provide an opportunity for encounters among scholars representing different cultural and religious identities, programmed for November 2016. To keep up to date on the project “Books, Bridges of Peace”, you can visit the website of the Library and its Facebook page.